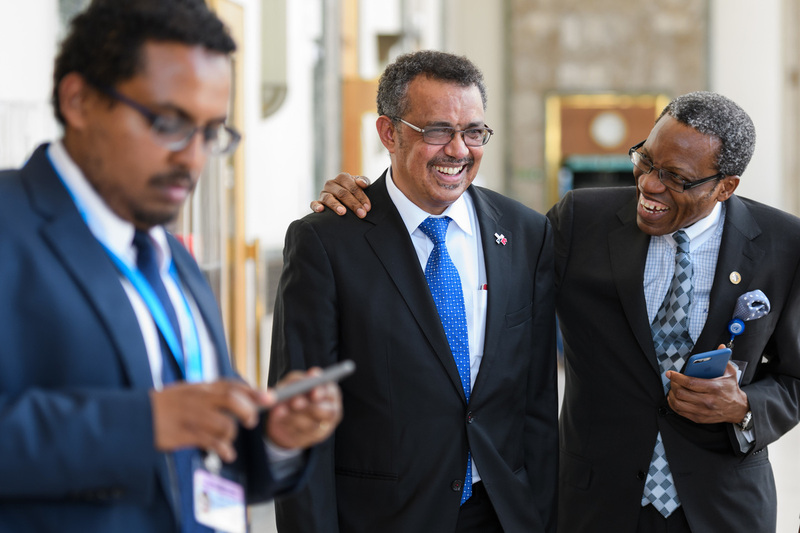 World Health Organization Elects First Director-General From Africa : Goats and Soda The new leader, Tedros Adhanom Ghebreyesus of Ethiopia, will be expected to reform the bureaucratic agency and deal with the world's growing health problems. Ethiopia's Tedros Adhanom Ghebreyesus, center, after his speech to delegates at the World Health Assembly on May 23 in Geneva. Health officials from more than 180 countries meeting in Geneva on Tuesday have elected a new leader for the World Health Organization. A former health minister from Ethiopia takes over an agency that's struggled recently to find the funding and exert the political leadership it needs to tackle the world's health problems. After two rounds of secret balloting delegates at the World Health Assembly in Geneva chose Tedros Adhanom Ghebreyesus to be the next director-general. Tedros, who goes by his first name (pronounced TAY-dros), won the job over Sania Nishtar, a cardiologist from Pakistan, and David Nabarro, a physician and WHO veteran from Britain who led the U.N.'s response to the West Africa Ebola outbreak in 2014. Tedros, who campaigned as "Dr. Tedros," is not a medical doctor; he has a Ph.D. in community health. All three candidates promised to reform the famously bureaucratic WHO, champion universal health care and make the world safer from the next global pandemic. In his final pitch for why he should lead the WHO, Tedros emphasized his experience as Ethiopia's health minister, overseeing the expansion of basic health services across the country. "In six years we built more than 16,000 health posts, 3,000 health centers, deployed more than 40,000 health extension workers," he said. This model of basic but universal health care in the East African nation has been widely praised. "It was a massive effort delivering massive results," he said. But the program was carried out by an authoritarian government in Addis Ababa. During a campaign in which many people have been calling for more openness at WHO, Tedros was criticized for Ethiopia's habit of downplaying domestic cholera outbreaks by labeling them "acute watery diarrhea." But Tedros promised that transparency will be at the heart of the WHO once he's in charge. "WHO must evolve to be more transparent, responsive, effectively managed, adequately resourced," he said during his final pitch. Tedros takes over a World Health Organization that has struggled to live up to expectations. WHO sets global health policy and advocates for improved living conditions, especially for the world's poor. But it's also been accused of being overly bureaucratic, slow, wasteful and ineffective. Outgoing director-general Dr. Margaret Chan admitted that WHO failed to respond quickly or forcefully enough to the West African Ebola outbreak in 2014. Paul Spiegel, the director of the Center for Humanitarian Health at Johns Hopkins Bloomberg School of Public Health, says the health challenges facing the world are growing more and more complex. "This is a make or break time for the World Health Organization," Spiegel told NPR. Infectious disease outbreaks like Ebola and Zika remain a major concern. "We are still awaiting for example a massive influenza outbreak that could kill tens of millions of people," Spiegel said. In addition to outbreaks, non-communicable diseases like heart disease and diabetes have become huge health problems globally. Spiegel says the world right now needs a strong WHO and WHO needs a strong leader. Tedros, the first African to be the director-general of WHO, will step in to that job in Geneva on July 1.